Summer is quickly approaching, and you may be looking for ideas on what to do with the kids once they are off from school. 1. 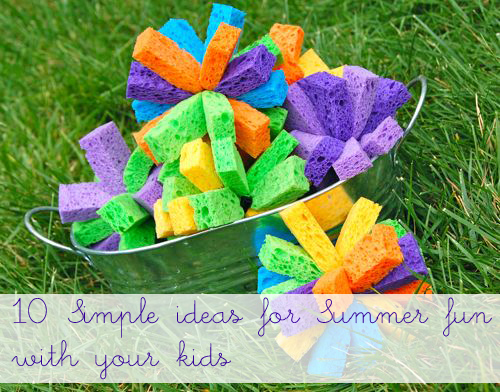 DIY Sponge Bombs — perfect for an impromptu sponge bomb bucket toss game! 2. 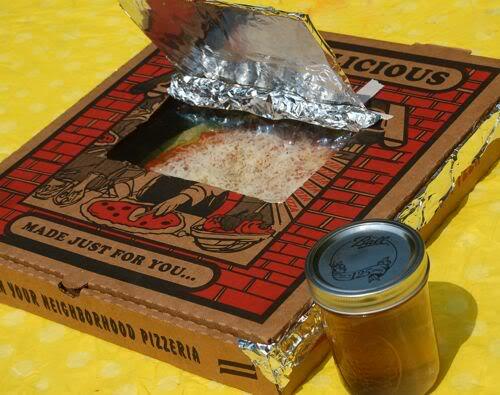 Make Your Own Solar Powered Oven — Heat up some pizza, s’mores for dessert, and some homemade sun tea for a solar powered lunch. 3. Sprinklers! — Looking for other ways to stay cool this Summer? Be sure to check out 10 Cheap Ways to Beat the Heat. 4. 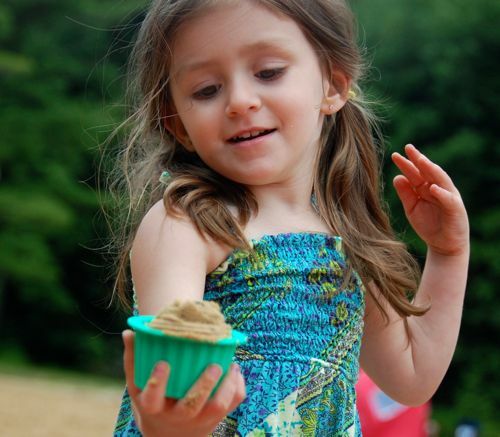 Play Sand Bakery — The sandbox is one of our most favorite Summertime toys. Whip up a batch of sand cupcakes, muffins, cakes, cookies, and more! 5. 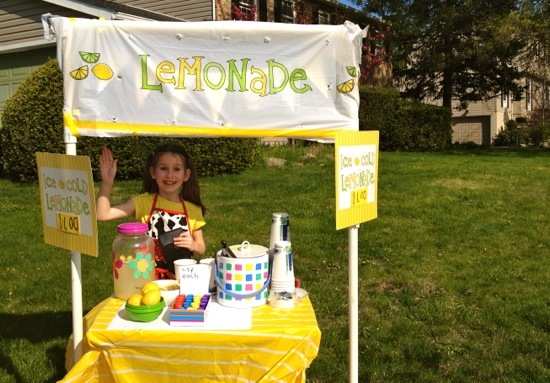 Set Up a Lemonade Stand — For some great tips to get you started, check out Emily’s guest post 10 Tips for a Successful Lemonade Stand. 6. 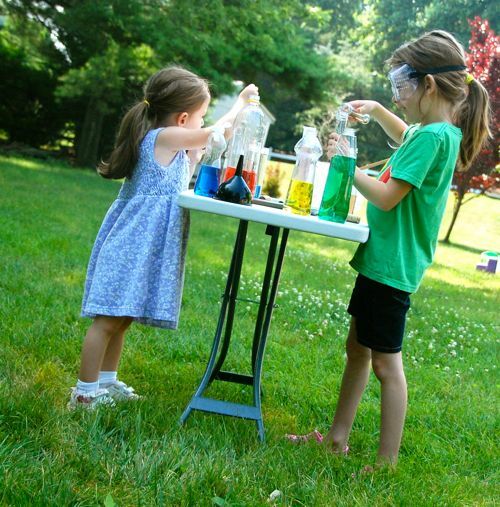 Pretend Potion Lab — Hours of fun, imaginative play! 7. 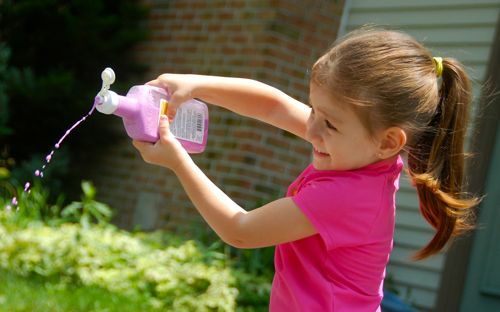 Driveway Painting — Make memories and lots of smiles with splatter painting on a grand scale! 8. 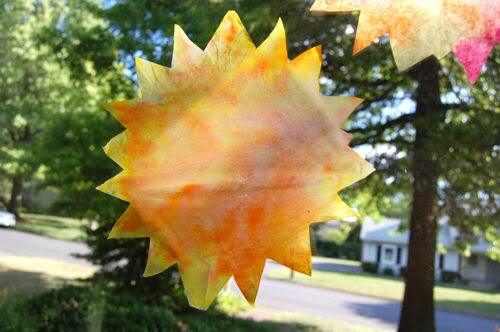 Sunshine Suncatchers — Made with cheap coffee filters, and watercolor paints. These sunshine suncatchers are sure to brighten up your home! 9. Go on a Picnic — Need inspiration? 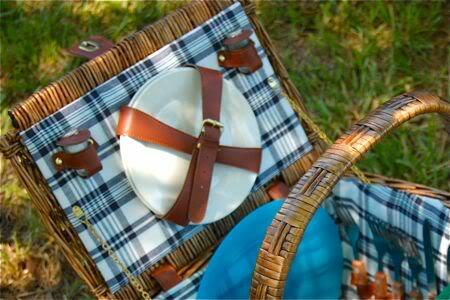 Check out our list of Top 15 Cheap Picnic Foods for ideas of what to pack. 10. 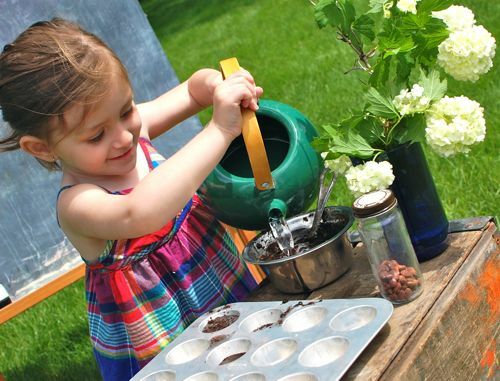 Outdoor Mud Pie Kitchen — Give your kids permission to get messy with their own outdoor mud pie kitchen. LOL, Ticia! You crack me up!! Stopping by from KBN. You have a great list here 🙂 I love the sponge bombs and the sun catchers. Will have to add those to our to-do list this summer! I love the idea of a solar oven! Can’t wait to do with this the kids. I love this list. Many of these are already cherished favorites, and the other ideas I can’t wait to try. he solar oven is a great idea! What a great list!! We’ll have to try some of these this summer! Great ideas!! Your daughters are the cutest! 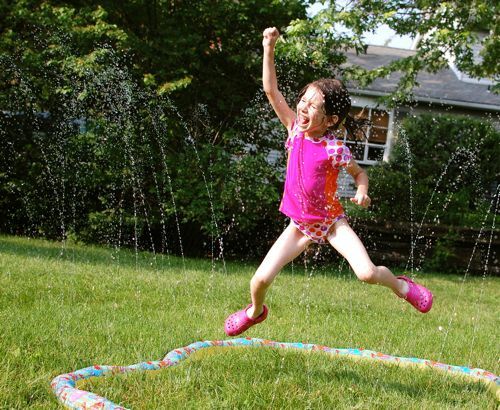 We have that sprinkler too! Love the pretend potions…so fun! Love these ideas! We tried the target practice yesterday and we had a great time. Thanks for the great ideas! These are great fun ideas. However, I live in a city where most kids live in condos and townhouses..usually little outdoor space, strict rules…Do you have a list of suggestions for these children? Thanks! This summer, our family is taking a virtual tour of America – 50 states in 1 summer! We started a website so we can share what we have learned with kids all over the country. Join us on our journey! And, please post comments – we love to hear what kids have to say about their home state! Visit http://grandtourkids.com/ for more! Cute ideas! I like how these ideas consist of being active and not sitting in front of a tv all day. I also really want to rent river floating tubes and float down the river with my older kids. Life jackets will be worn!